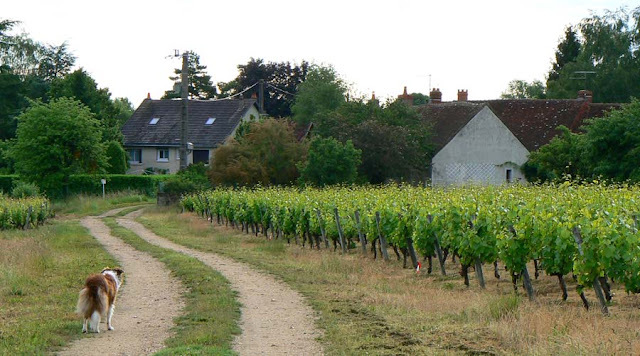 Monmousseau is a rather large operation compared to what we're used to in our little corner of the Touraine region. 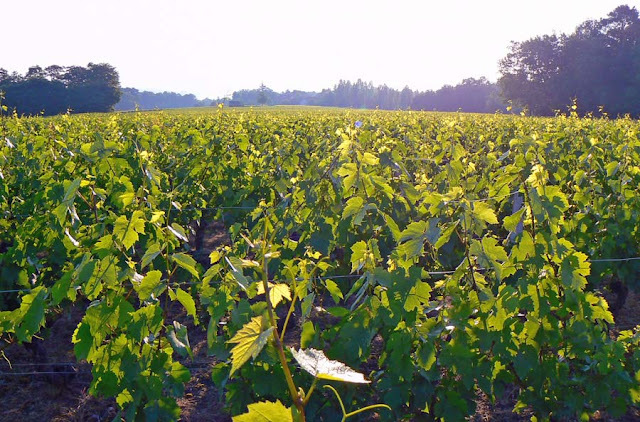 Near us, most growers and vintners are small family operations. 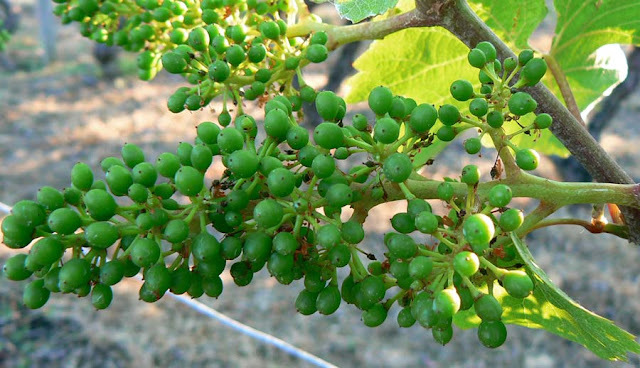 Production is small to moderate, and the winemaker is usually the person who grows the grapes. There are a few co-ops, but their scale is moderate. Monmousseau, on the other hand, is larger, corporate, and set up to receive visitors with scheduled tours throughout the day. Our tour guide told us that they currently have about four million bottles stored in their cellars. The Monmousseau retail shop and entrance to the art exhibit. If you're in the area, I'd recommend going to see it, especially if you've not seen a sparkling wine operation before. The tour (which costs a few euros) is long enough to be interesting, but short enough not to be boring. You see the caves and the guide explains the sparkling wine process step by step. Then you go through the bottling and packing plant. At the end of the tour there is a tasting, of course, after which you can wander around in the retail shop. Not only are their premium wines a good deal, but when we were there they had a bargain bin set up and many good wines were on sale. There are also do-dads, t-shirts, postcards, etc. 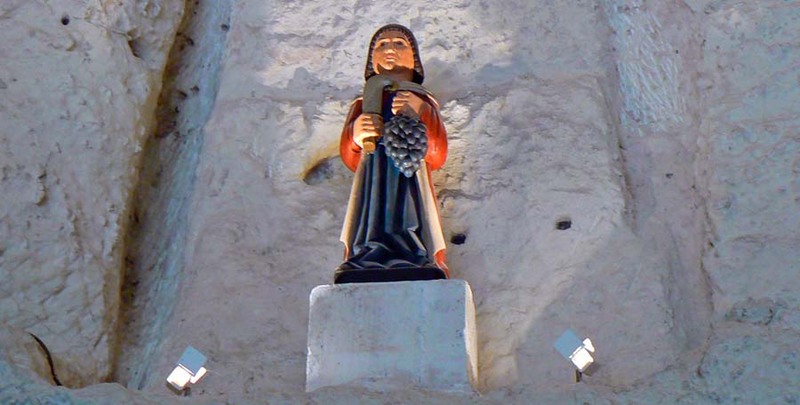 A statue of a wine master St. Vincent, patron saint of grape growers, above the retail shop. There's often a exhibition of local art in the galleries just behind the shop that you are invited to enjoy while you wait for the next tour. 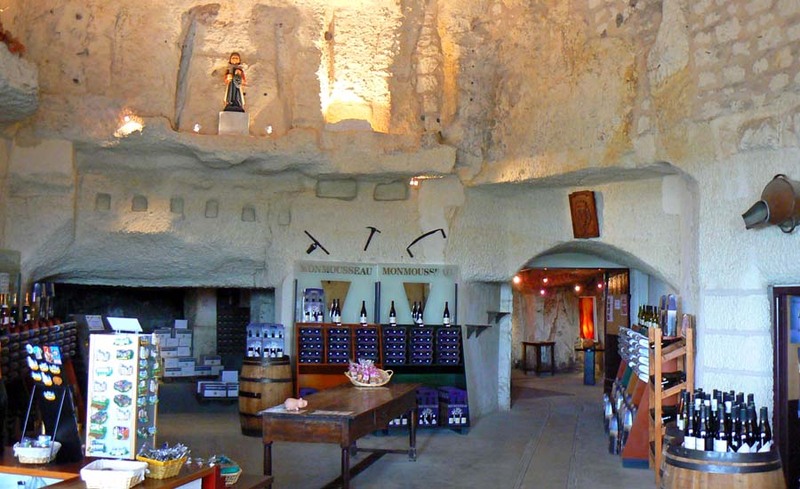 And on a hot day, especially, the tour through the caves (cellars) is refreshingly cool. Or not. 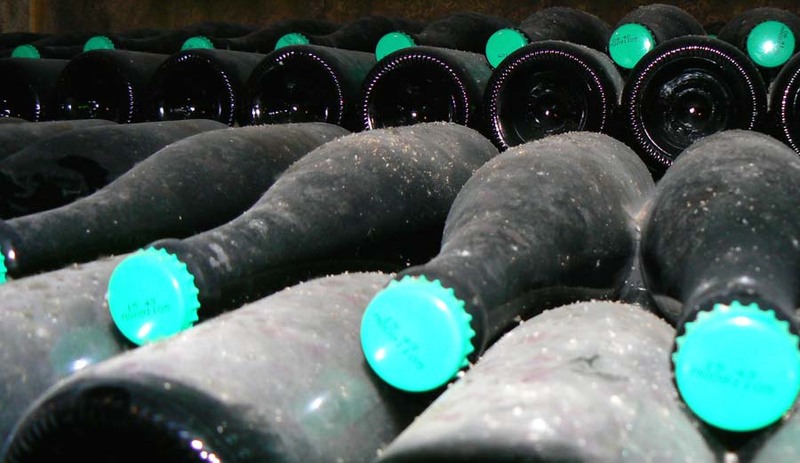 These are bottles of sparkling wine that are fermenting at the Monmousseau wine caves near Montrichard (about twenty minutes from us). They're not corked yet, but closed with bottle caps. Once the fermentation is done, the bottles are riddled to move the sediments down to the neck. The sediments are then removed and the cork and capsule are put on. Wine made from chenin blanc grapes becoming bubbly. We took the tour of the caves and bottling plant yesterday with Peter and Jill. There was a French couple on the tour with us, so we were six all together. The guide did the tour both in English and in French. She was very good, friendly, and informative. We had a nice taste after the tour and bought a bunch of bottles. Merlan filets with seared vegetables and a sprig of mint from our garden. After that, we stopped in town at a bakery, a charcuterie, and a grocery store. Then it was home for a light lunch of boudin noir (blood sausages) cooked on the grill and a salad of leeks in vinaigrette. 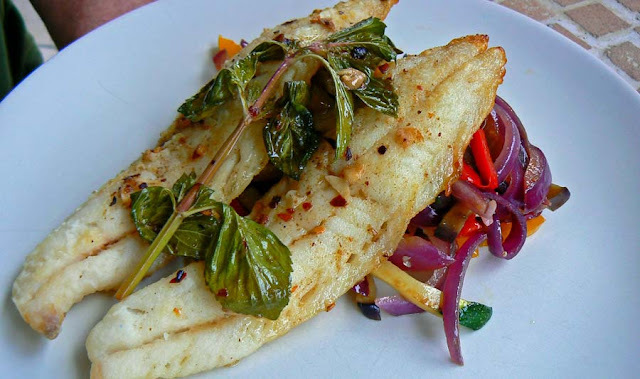 For dinner, Peter made a fish dish with merlan filets served on pan-seared vegetables (pepper, zucchini, eggplant, and red onion). We washed it all down with bottles of still and sparkling wines from Monmousseau. 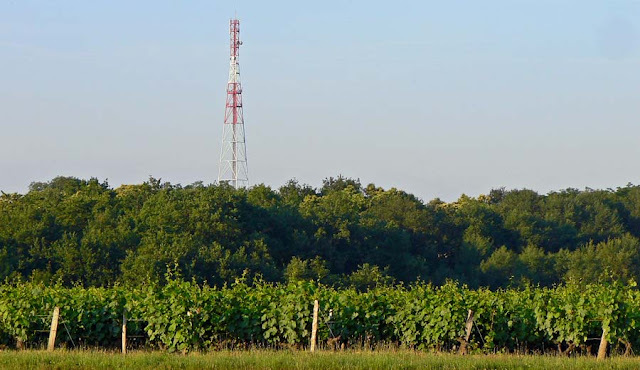 This tower, or pylône in French, is a few kilometers west of our house just at the point where the vineyards give way to forests and fields of other crops. I presume it's a tower for microwave transmitters, the kind the telephone companies use for their signals. But I'm not certain of that. The pylon is visible from the vineyards out behind our house. At any rate, the tower stands alone near an intersection of small roads that connect St.-Aignan with Orbigny and Céré-la-Ronde. It's even marked on the maps. And curiously, there is no blinking red light on top to warn aircraft of its presence. And we do have air traffic around us. Light planes, sailplanes, the occasional helicopter, frequent ultra-light motorized hang-gliders, and hot-air balloons. I suppose most of those things don't fly after dark, so the red and white painting does the trick. Today will be the warmest day of the year, so far. It certainly has the record for the warmest morning low this year at just over 18ºC (about 65ºF). Our high yesterday was near 30ºC (about 86ºF) and dry. These are very pleasant days and the vegetable garden is loving it. And the vineyard is looking very summery. The growers are plying the rows in their tractors trimming and spraying. Looking northeast into the sunrise; our house is barely visible in the top center. We have our first house guests of the season arriving today. Friends from California, who have both been here before, will be the first to stay in the new guest room. 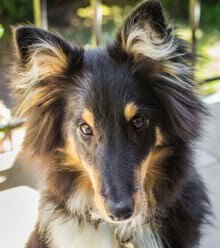 You can read about that on Ken's blog if you haven't already. I'm planning to make a quiche that we'll have with pâtés and other things later in the day. It'll be a good day for eating outdoors. Neatly trimmed rows soak up the morning sun. If I'm really industrious, I will make some ice cream. We were given a little ice cream maker by a friend who moved and couldn't take everything. It will be the first time I've used it. We used to have one of those old Donvier ice cream makers many years ago. That's the one where you freeze the bowl then hand-crank the mixture. This new one works the same way, except that it has an electric mixer, so there's no hand-cranking. The flowers are gone and the grapes are forming. Remember the zucchini sprouts I posted a few weeks ago (here's a link)? Our snap of cold weather slowed them down a bit, but now we're having wonderful summer heat and they're growing like gangbusters. It won't be long before the first blossoms appear. 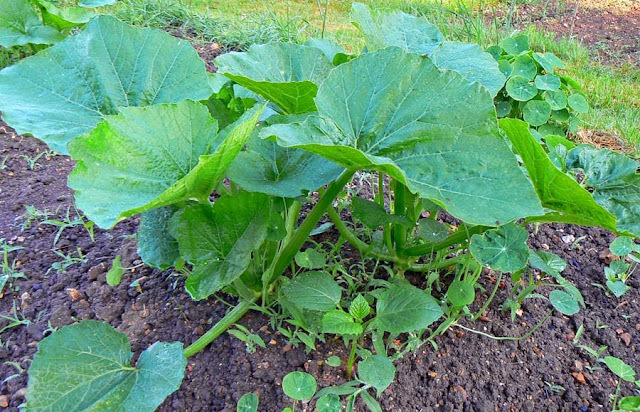 Zucchini, some nasturtiums, and a bunch of weeds. I just googled "gangbusters" and learned where that phrase came from. "Gang Busters" was an American radio show from the mid 1930s through the mid 1950s. The show opened with a cacophony of sounds including sirens, police whistles, and gun fire. That noisy opening spawned the phrase "to come on like Gang Busters." I've used that phrase all my life without ever knowing its origin. Our radis (radishes) are doing very well. Too well, almost. We have to eat more before they get too big. Our favorite way to eat them is raw with salt, bread, and sweet butter. It's a great starter before lunch. But we've also cooked them various ways and that's good, too. 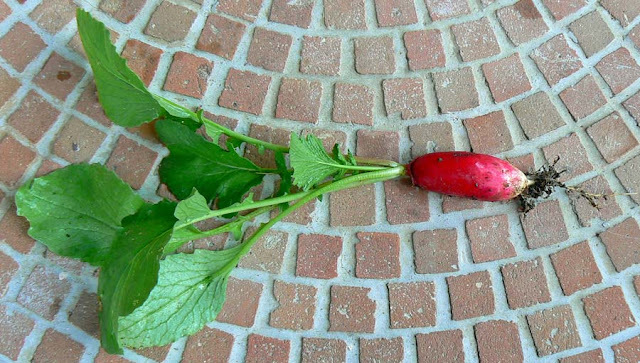 In France, the most common radish is the long red and white radis rose. Radishes in the ground, ready to pick. We also eat the leaves. They're good made into a pesto, just like with basil. Radish leaf pesto is great in the spring and early summer when it's too soon for the basil to be ready. The leaves are also good as a salad, dressed with vinaigrette. A single harvested radish before trimming. Just last week I planted a third row of seeds and they've sprouted. And when the current rows are all harvested, I'll plant some more. 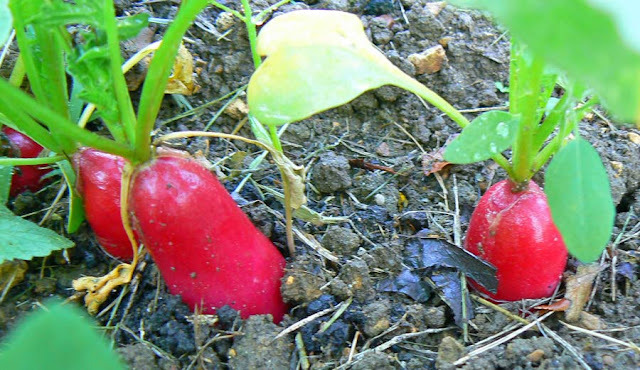 We'll be eating garden fresh radishes all summer long. The weather on Wednesday was spectacular, just as the weather people said it would be. And how often can you say that? American friends Joel, Lynn, Hannah, and Rachael came over from their vacation house near Valençay to have lunch with us. We set up the barnum (dining tarp) in the yard and got everything ready for lunch outdoors. Hannah, Ken, Joel, Lynn, Rachael, and Callie. 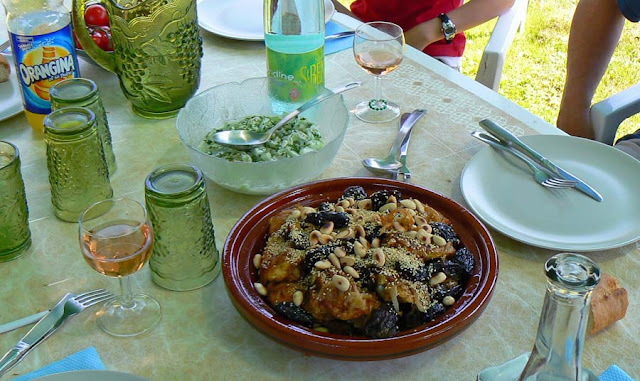 Ken made a spicy tagine of chicken with prunes, onions, almonds and sesame seeds which we served on couscous. Along side were a grated carrot salad and cucumbers in a yogurt dressing. We started out with nibbles and a local sparkling rosé, then followed with a Sidi Brahim rosé (from Morocco), a red Bourgueil, and a red Sancerre (both local Loire Valley wines). Dessert was a lemon tart. Spicy tagine of chicken, onions, prunes, almonds, and sesame seeds along side cucumbers in yogurt. Callie enjoyed her spot under the table when she wasn't fetching tennis balls thrown by the girls. Bertie even made an appearance later in the afternoon. We had a great time and were sorry to see our new friends leave. They head back to Paris on Monday for their return flight home after a nice month-long vacation in central France. We're having visitors for lunch today. And we're lucky that the day is predicted to be sunny and warm with temps in the mid-70s F. But there is much to do. I'm making a tart for dessert and a couple of salads. Ken is handling the main course. If we remember, there may be photos. 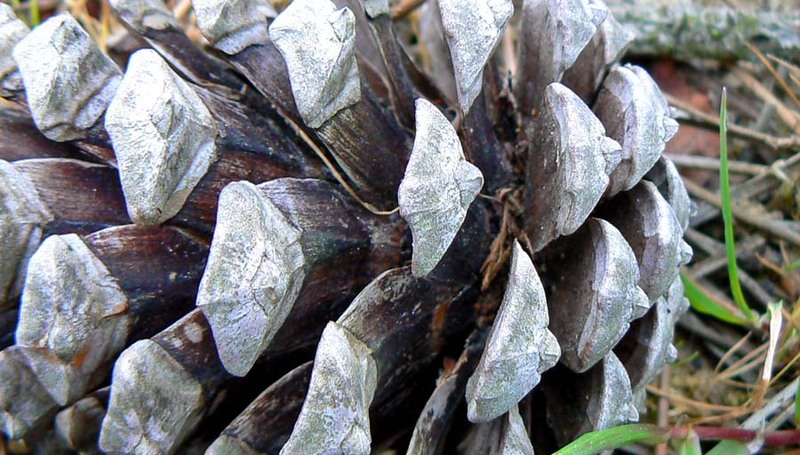 A pine cone on the edge of the vineyard. We think we have the attic floor just about done. Today I'll take a brief break to do some yard work while Ken works on the edges of the floor. 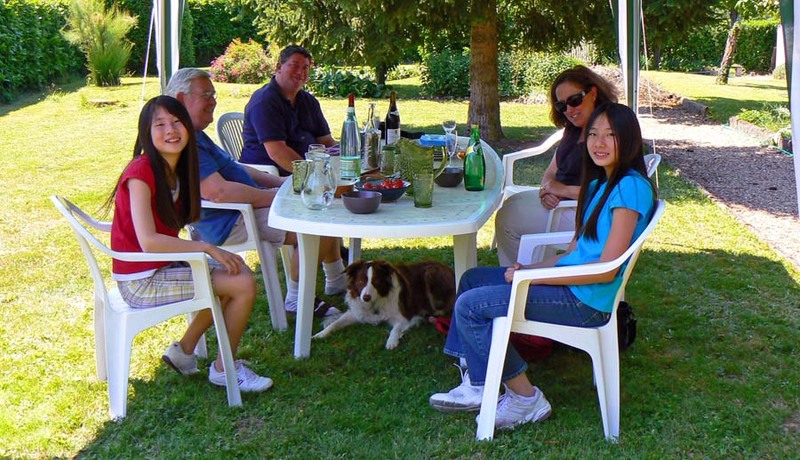 Then on Wednesday we're having people over for lunch (the same people we met last week in Valençay) and on Sunday friends from California are arriving for four days. 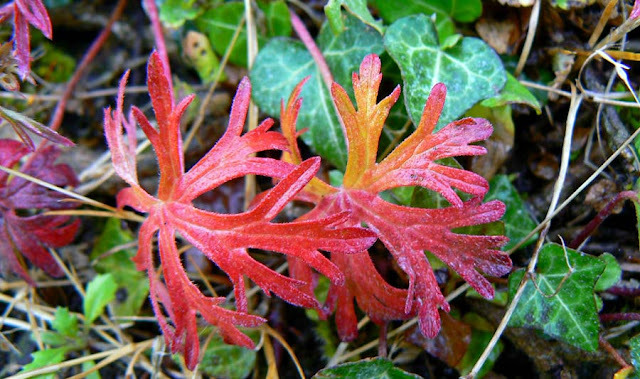 Tiny red leaves growing close to the ground in the vineyard. In between we need to tidy up a bit and move some furniture so we can set the guest room up. These are all incremental steps on the way to finishing the attic and moving in. The next big job up there will be prepping the walls for paint. A little sanding needs to be done first, along with a little patching and smoothing of plaster in places. Then the primer will go on. We got a good deal on primer for drywall at the hardware store last week. After that we will have to pick a color and find the paint. We'll likely go for an off-the-shelf off-white/beige. No custom mixing, just something easy and economical. We're going to need a lot of it. 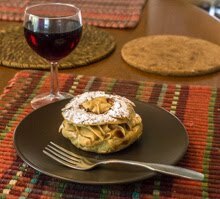 Last week we had lunch over near Valençay with new friends we met through the blogs. They had rented a gîte (vacation house) there and asked us to come for lunch. We had a great time and ended up staying for a late supper, too. Their twin daughters enjoyed playing with Callie all through the day. Callie had a great time with her new friends. Hannah and Rachael and Callie. And the ball. Callie found an old deflated toy soccer ball somewhere around the property. I showed the girls how the dog liked to fetch and they threw the flattened ball like a frisbee all around the yard. Callie, of course, would fetch it and take it back to them for more. Callie works on destroying what's left of the ball. In between sessions, they all sat down on the lawn and rested, picked little flowers in the grass, and told secrets. I wonder what Callie told them? I know Ken posted his poppy photos a few days ago, but now you have to see mine. The weather has been pretty yucky lately. Deeply overcast skies and some rain. The rain is good, but the dark days are depressing. Especially since we're just about at the summer solstice. Come on, sun! 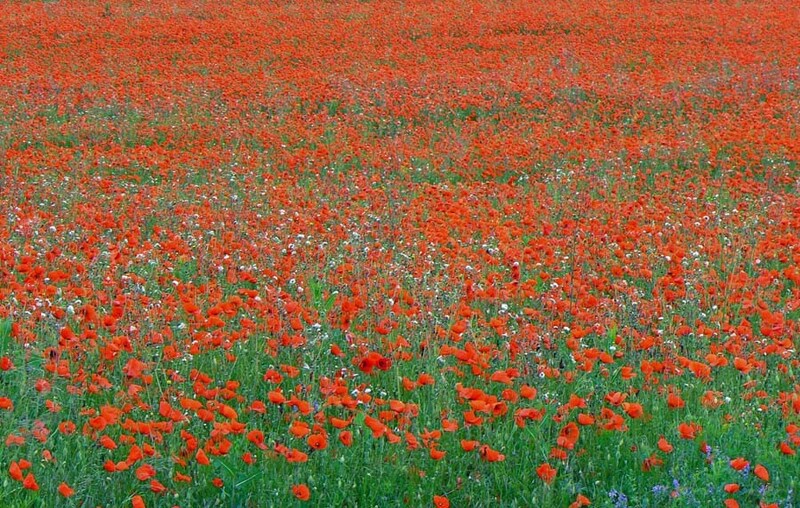 Poppy fields are common in France and are simply stunning to see in full flower. But we're busy. The vegetable garden is finally all planted. I put in a total of twenty-eight tomato plants, fifteen aubergines (eggplants), twenty-one peppers, six zucchini (courgettes), five patty-pan squash plants, four rows of sweet corn, a row of swiss chard, and some parsley and sunflowers. And radishes are ready for harvest. I grew it all from seeds. This one is along a country road in the middle of nowhere. Weeding needs to get done periodically, as does grass-cutting. And then there's the attic. Ken did a great job preparing the floor for finishing. On Saturday, I put the first coat of polyurethane on. 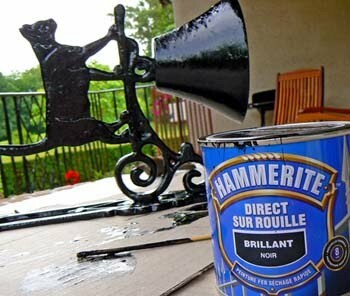 The second coat will go on today. Then we'll see if we need/want a third coat. After that, we need to move the bed up there (or at least the mattress) so that we can put the guest bed in the old bedroom for guests who arrive in a week. The title of today's post is a line from a very well-known American film. Do you remember it? This is really not a big deal, but it was a good deal. Our house is equipped with one, I repeat: one, closet. 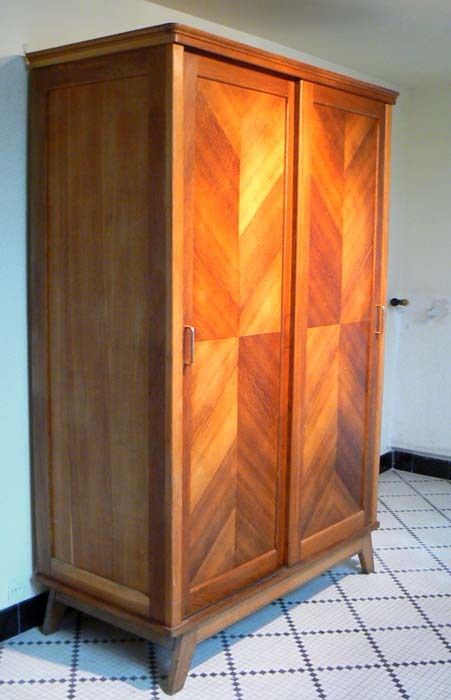 In France, closets are not generally found in older homes and apartments. What people use instead are armoires, pieces of furniture that function as closets. We have a couple, down in our utility room, that we bought several years ago. They're modern, pressed-board assemble-it-yourself style things that are utilitarian, but not very pretty. The new armoire in the entry hall. Of course, armoires come in all kinds of amazing styles, most very ornate. You can find hundreds of them for sale in antique stores or second hand stores. This one, less ornate than many others, we found in one of our local second hand stores. We thought that the style goes well with our mid-60's house, and the price was right: €60. We'll use it in the entry hall, pictured here, but not necessarily where it's sitting now. It will be a great coat closet and is big enough to hold other stuff, too. You'll probably see it again once we finish the room. On Tuesday we crossed a border. 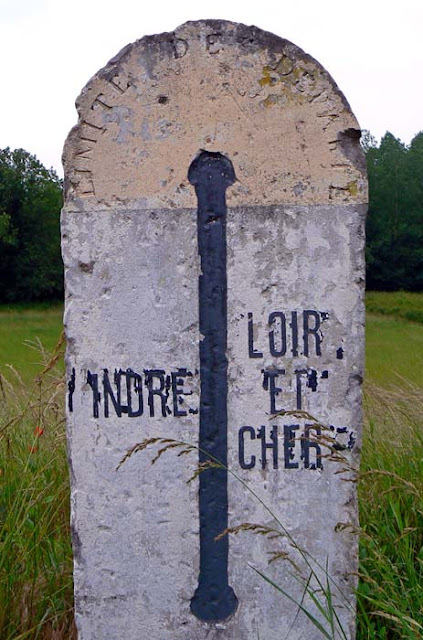 It's the part of the border between our département, le Loir-et-Cher, and a neighboring one, l'Indre. Of course, we cross these borders all the time and usually see a very contemporary sign welcoming us to the new département. But I've never noticed this old version of the limit marker. The Indre on the left, the Loir-et-Cher (where we live) on the right. It's on a very small road out in the country that doesn't get much traffic, except for locals and tractors. We stopped to take pictures of a field of poppies and noticed it. Otherwise, we might have missed it altogether. It stands about a meter tall. 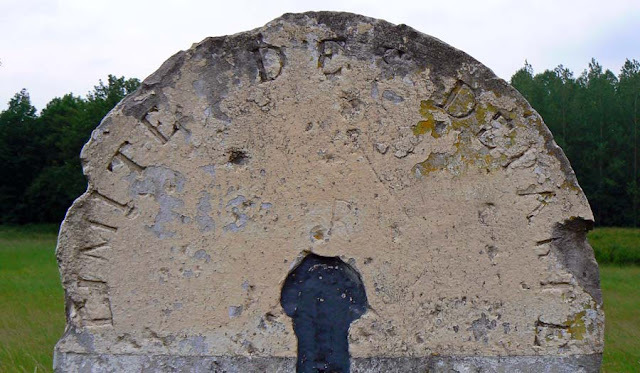 The inscription carved on the rounded top says, "Limite de départe." They didn't have room for the -ment, apparently. A closer look at the inscription. I wonder if this would be called une borne like the little distance markers you often see alongside French roads. Those are red or yellow and white and indicate how many kilometers you are from the town you're headed toward and/or which route you are on. They're much smaller than this one. There's a meadow of sorts out next to one of the vineyards behind our house. When we first moved here, there was a donkey penned in out there and he kept the grass very neatly trimmed. But in recent years the donkey is gone and the field has grown up with tall grass and wildflowers. 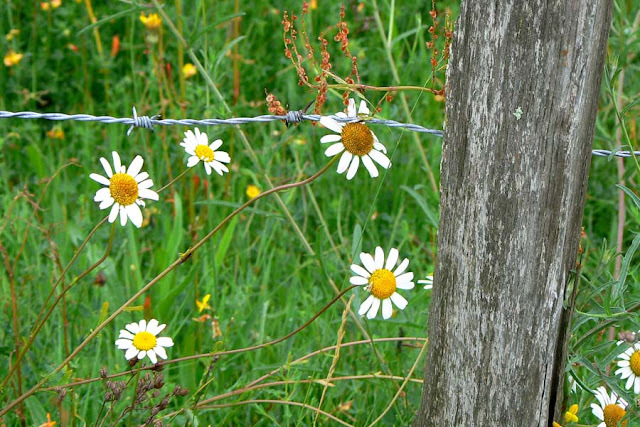 Daisies growing up along the barbed-wire fence that encloses the meadow. We still hear the donkey braying over near the field, but he must be kept closer to the owners' house these days rather than in the meadow. Callie knows where home is. If I ask her if she wants to go home, she knows what I'm saying. 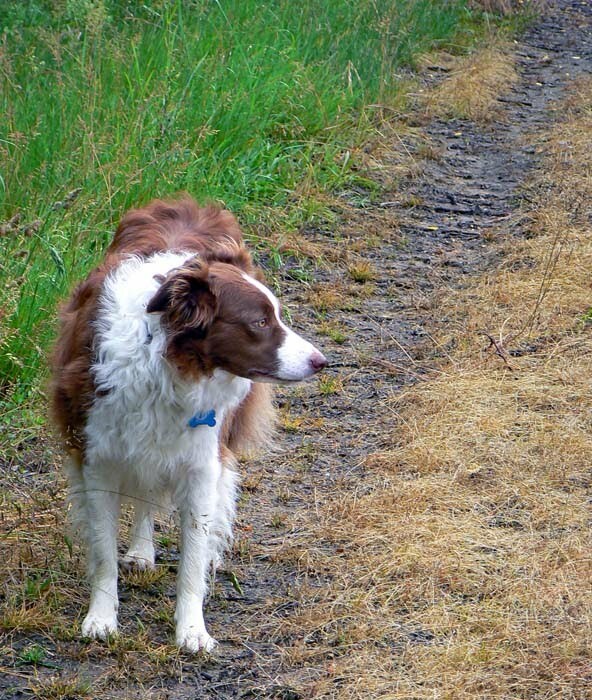 Sometimes on our walks she decides that she doesn't want to go further out into the vineyard and stops to look at me. I say, come on, this way, but she stands there or turns halfway around. Do you want to go home I ask? She leaps around and starts trotting back toward home. Almost there! Callie has the house in view. I know she thinks my walk route is boring. I usually just head out to the end of the dirt road and back with maybe a detour or two around the vines. She much prefers Ken's walks, which are way more adventurous and unpredictable than mine. 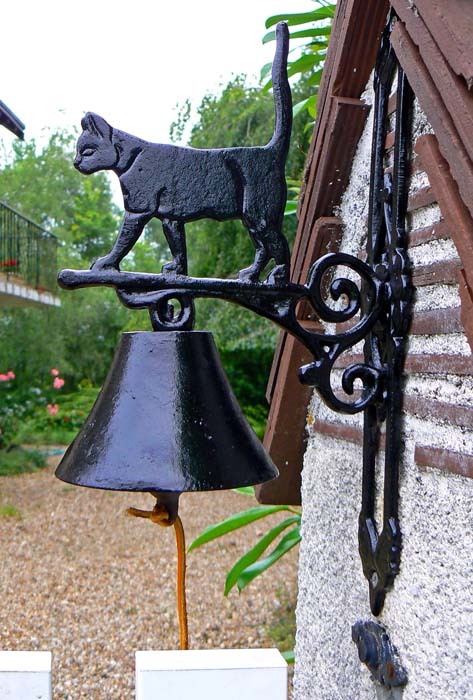 Back in 2004 when our friend Sharon visited us from Washington State, she offered us this cool bell for our front gate. Our doorbell had a loose connection and often wouldn't ring. Sharon thought this would be a nice alternative, even though we didn't own a cat at the time. I installed it on the gate post just above the regular doorbell button. It was originally rust-colored and blended in with the brick and tile on the post. Some people still tried to make the electric doorbell ring, others went right for the bell. The black bell stands out nicely against the gate post. 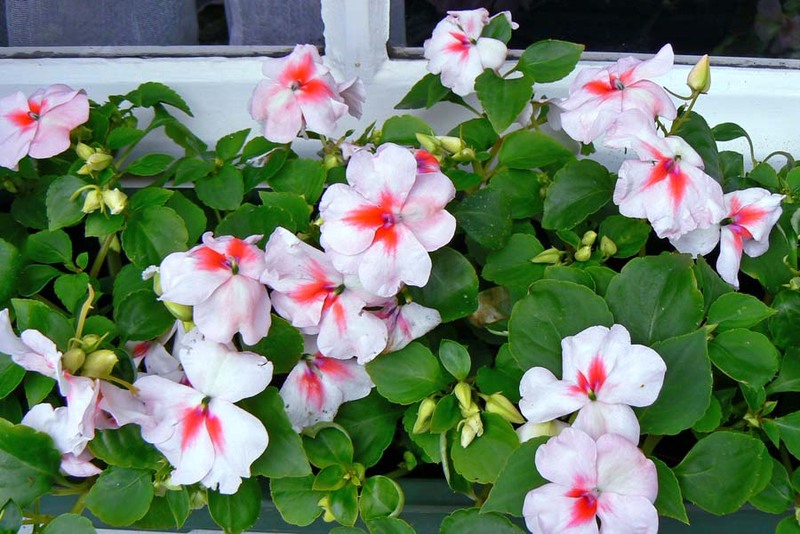 In recent years we've been putting impatiens in window boxes on the north side of the house. 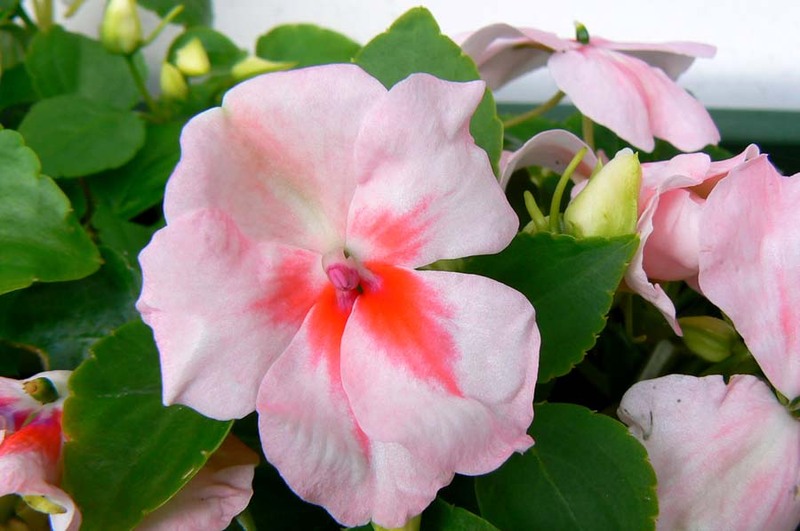 It gives us a little color outside the living room window and impatiens like shady places. I've had bright red, purple, white, and even orange flowers out there. There are three window boxes like this out the north window. But this year I saw these two-toned pink ones at the nursery and knew they'd look great. So I got a flat for the window boxes. I'm pretty happy with them. Now that the workers are done and have turned the attic over to us for finishing, I thought I'd share some before and after photos. They're not exact matches, but they're close enough for French government work. What the before photos don't show is the attic floor covered with about an inch of dust, dirt, feathers, cardboard, carpet, and other debris that we cleaned out before I started taking pictures. This is looking north. In the before photo, the window is open so it looks a little bigger that it actually is. It's the same window in both photos. The floor is not the same, however. The old floor was wide planks set directly over the joists. They are still there, but there's a layer of builder's felt, a layer of OSB (oriented strand board), and the pine finish floor over all of that. This is the view looking northwest. You can see how we had the storage closets built into the eaves and where the Velux window was installed on the sloping roof. The chimney you see here comes up from the living room fireplace. Here we are looking to the southeast. In the before photo you can see the old hatch and ladder access on the lower right. That's now gone, replaced by the stairwell in the center. The chimney on the left comes up from the kitchen exhaust fan; the one on the right from the boiler in the utility room two floors below. Looking southwest, and the boiler's chimney is completely boxed in with the niche and a closet, and the second Velux attic window is in place. You can see a bare light bulb in the before and after photos, but before, it was attached to the beam. In the after photos, the new bulb is hanging from a wire over the stairwell. We'll put a fixture up there after we paint. So that's pretty much it. We've now got to get moving on varnishing the wood floor and the stairs. After that we'll be able to sand, prime, and paint the walls. We'll be posting photos of that process as we go along. And I'll probably drink some. 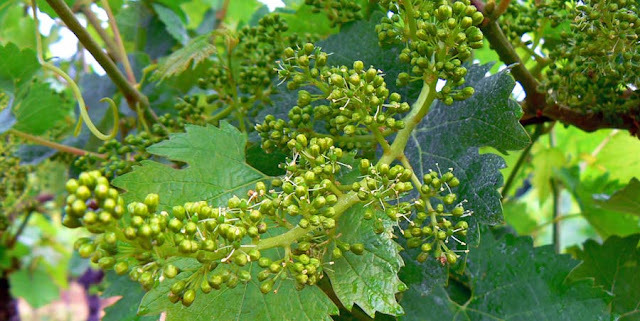 The grappes are developing nicely and the flowers, such as they are, are opening. It won't be long until the tiny fruit appears and begins to grow into full-sized grapes. The tiny young grape buds still point upward toward the sun. At this point we are entering summer (although the solstice is still about a week away). 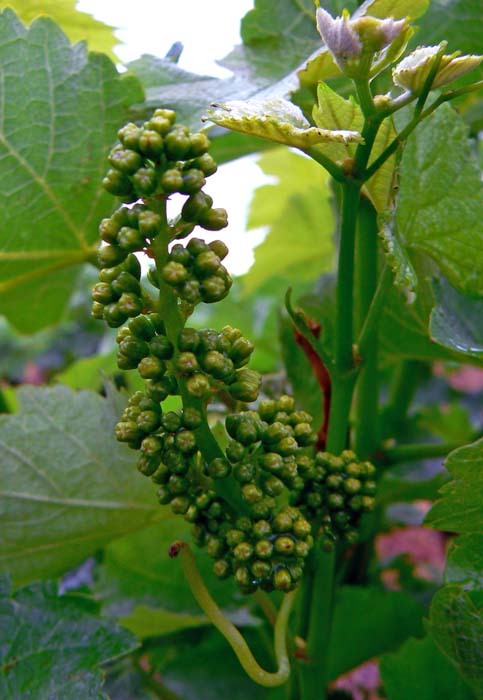 Now the only thing for the growers to do is to trim the vines, which directs the energy into the grapes as opposed to new leaves, spray against mold, and hope there are no hail storms. Once autumn arrives, they'll be out there with their little kits to test the sugar levels in the grapes and determine when the harvest will start. But that's a long way off still. The rains are winding down and the clouds are parting a bit. We're still expecting showers and the occasional thunderstorm over the weekend. The garden is really enjoying the rain we got, but now it needs to drain a bit and get some sun. I'm hopeful that will happen now. 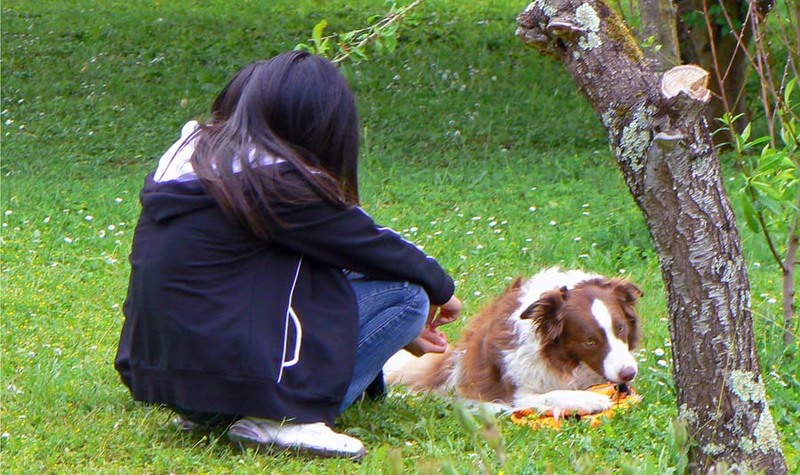 Callie stops, looks, listens. She's on the lookout for critters. My cold seems to be getting better. Thursday was the worst day so far. I thought my head would explode. But I slept well enough overnight and this morning I feel better. Less congestion, less headache, less coughing. That's a good thing, if it lasts. I have the impression that the attic work is winding down. The guys are working on details now and there's not much left for them to do. But all that means is that we need to take over. First up: varnishing the floor and stair. Then we've got to clean up the wood beams a bit. Then it's on to painting. But I'm too tired to think it about it right now. I'll think about that tomorrow. After all, tomorrow is another day. These are redstart hatchlings. They couldn't have hatched more than a couple of days ago. Their parents are busy making food runs so I took advantage of their absence to snap a photo. 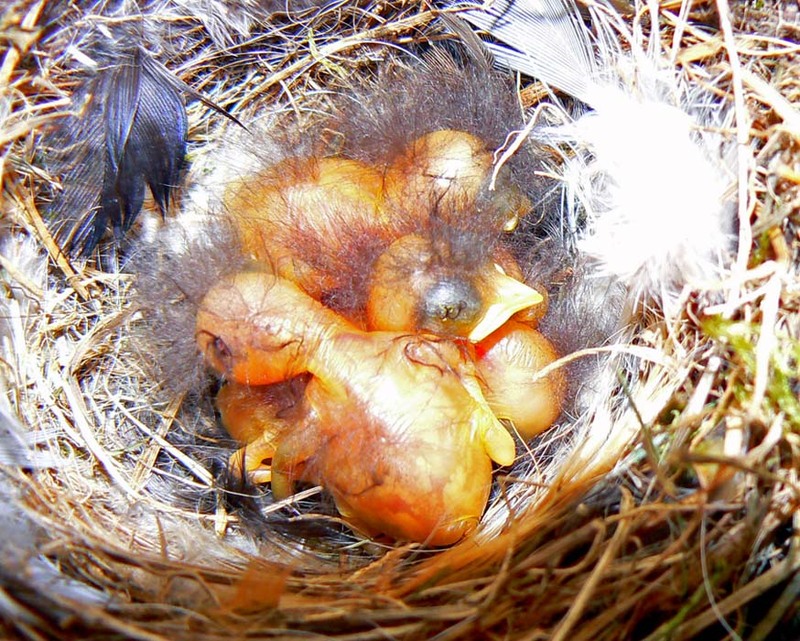 The redstarts built their nest on our deck, precariously perched under the porch roof. I hope I didn't blind them with the flash. Uh-oh. I think there are three chicks in the nest. They're tiny; about an inch each. Redstarts tried to nest here once before in 2006. The chicks disappeared mysteriously one night. They were nowhere near ready to fledge, so I suspect that some predator got them. We'll see how far these little guys make it. "I didn't want to get them dirty." - someone who lives in this house and isn't me. 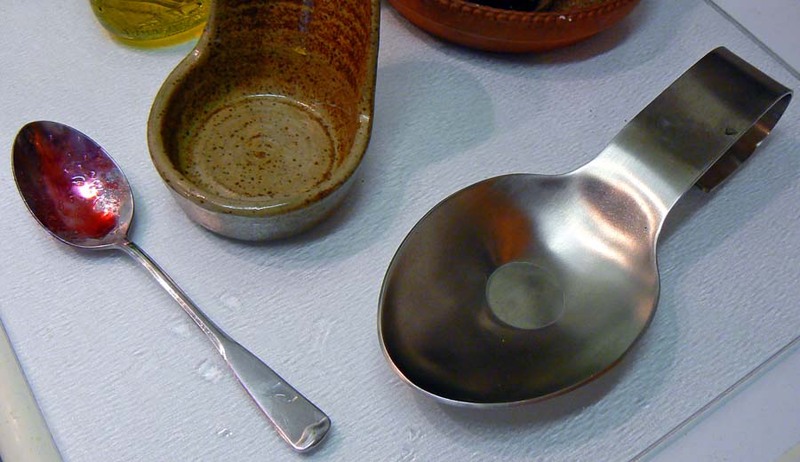 Two clean spoon rests and one dirty spoon. 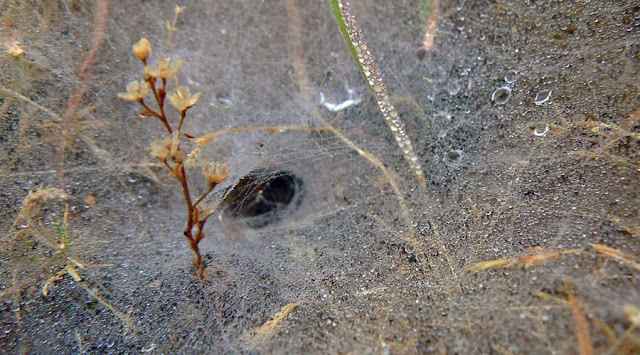 I don't know what species of spider builds this ground nest and web. It doesn't look like much to our eyes, but imagine what it must seem like to a flying insect. A comfortable landing strip? A rest stop for a drink from dew drops? I'd be leery about this if I were a flying insect. The guys working in the attic made some progress on Monday, but then informed us that they'll be off doing something else for two days and that we'd hear from the boss about when they'd be back, likely by Thursday. As for the progress, all but one of the closet doors are installed. The baseboard is installed, and three quarters of the last exposed wall has been drywalled. We had an issue with mitering. That's where two pieces of wood are joined at an angle. Usually a mitered joint is cut at a forty-five degree angle. But in the case of the trim around the stairway, which was done with quarter-round strips, the ends were simply butted together. Very unattractive and unprofessional. We pointed this out to many folks who insisted we should make the contractors make it right. So Ken talked to the guys about it and they re-did it. And, they said, they would be mitering the baseboards in and around all the corners. Alas, yesterday's inspection revealed that only the most visible of corners were mitered. Several of them were done the lazy way. I'm sure we will never see them as they'll likely be behind something and even if they're not, it's not going to be very noticeable. But still, it makes me wonder what other corners they're cutting. Or in this case, not cutting. I should say that these are the young guys who are likely not all that experienced. If Coco, who is off the job due to injury, were here to direct and supervise, I suspect these things would have been done differently. If you drive around here right now you will see cherry trees laden with deep red fruit. These are not orchards I'm talking about, but trees in people's gardens. Along with apple trees, most people with a little land have one or more cherry trees as well. We have one, but it's not a good variety. I describe the fruit as a pit with a layer of skin around it. 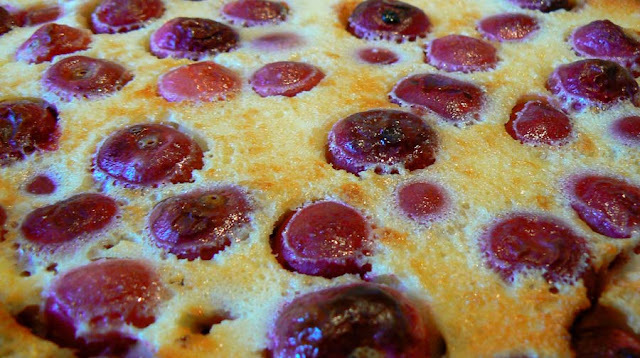 Sunday's dessert: clafoutis de cerises. But we do get good cherries from our neighbors' trees and several trees out by the vineyard. The land those trees are one belongs to someone who lives in another part of town, and there is never a rush to pick the fruit, so we go out and pick some when it's ripe. If we don't, the birds will. This year we've been especially fortunate in that some friends who just moved a couple of towns over have a huge cherry tree in their yard, and they've brought us bags (literally) filled with ripe fruit. And what do you do with cherries? Sauces, preserves, and clafoutis. I made this clafoutis for our Sunday dessert and it was very tasty. Nothing is more simple to make than a clafoutis. It's an egg custard poured over whole cherries and baked. The cherries are not even pitted in most French recipes. You can pit them if you prefer, but the French say the flavor is better if they're not pitted. No one thinks twice about piling up the pits on their plates as they savor the dish. And, according to Miss Manners (Judith Martin), it is not impolite to remove pits from your mouth at the table, as long as they come out the same way they went in; that is, on your fork or spoon. 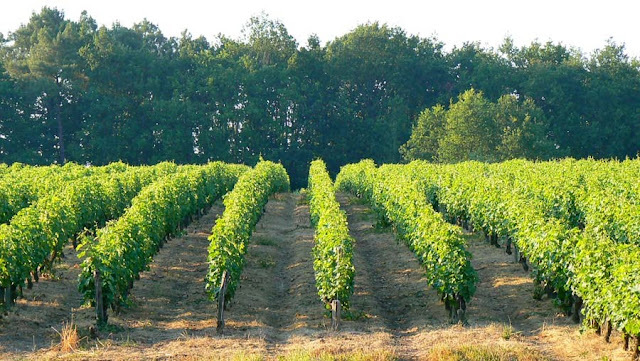 The vineyards around us have put on their summer clothes. Lush new leaves turn the regimented rows into neat seas of green. It's so different from the browns of winter, and a refreshingly welcome change. Saturday morning, looking southwest away from the house. Today we're invited for mid-day apéros at a neighbor's house, along with other friends. Then we're coming back to our house for a lunch of roasted pintade (guinea hen) and potatoes. Later, the men's final at Roland Garros (on tv). There's a threat of thunderstorms, but otherwise it should be a nice day. This year we're trying something new out back. 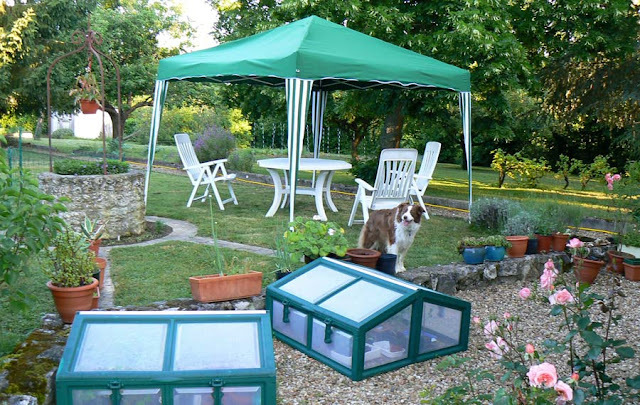 Rather than use our old umbrella, which is totally inadequate for producing shade for more than one person, we picked up a tarp "thing" when it was on sale a month or so ago to set up in the back yard. That's still the old, smaller table for now. It's three meters square and will accommodate the longer table that we got last year. Since we got rid of the tree stump behind the well, I've re-seeded the ground there. Once the grass grows in we'll move the tarp to that spot for the rest of the summer. We're looking forward to testing it out today when Jean and Nick drop by for a late morning coffee. You can see our cold frames in the foreground. They're quite mobile and dismantle for storage. I'll get most of the plants into the garden this weekend and we'll use one of the cold frames for basil. It's amazing how warm they get inside. But don't go trying them to find out. This one is most certainly not edible twice. Here in France, and even here around where we live, people do gather mushrooms in the wild. They are people who know what they're doing. We've been given gathered mushrooms and enjoyed them. This mushroom will not end up on my table. But first we verified that they were the kind we could eat twice. To do that, you take your mushrooms to a pharmacy and the pharmacist, who is trained in mushroom lore (mycology) will tell you if they're ok to eat. You can do this anywhere in France. 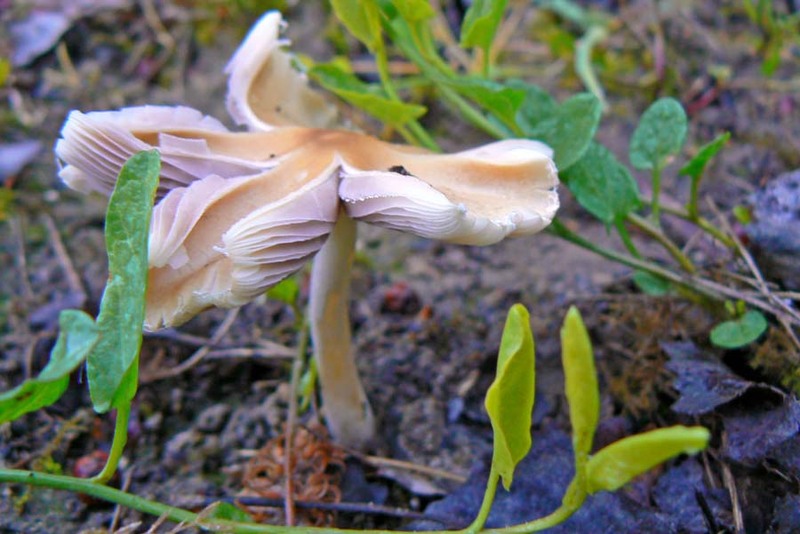 There are edible mushrooms that grow in our yard, but we've never eaten them. Of course, you can also just buy your mushrooms from a vendor or a store. In our Saturday market there's a local lady who grows mushrooms in her caves and sells them. She grows several varieties (white and brown button, shitake, oyster) and sets up her little table and sells them. They're always beautiful and they're always delicious. We buy dried mushrooms from the Asian supermarket in Blois. They're good when soaked and added to soups, stir-fries, and stuffings. Up the road from us, there is a commercial mushroom cave that deals in large quantities and gives tours. We've done the tour once and it was very interesting. The caves were originally the quarries from which limestone was taken to build many of the châteaux in the Loire Valley, including Chambord. Now the galleries are home to bundles of dirt into which the various fungi are injected, resulting in crops and crops of mushrooms. Most of the mushrooms we eat are the locally grown champignons de Paris (button mushrooms). Sometimes, though, we'll treat ourselves to more exotic varieties like cèpes, chanterelles, or even trompettes de la mort. As my father used to say: there's a fungus among us. So said Gertrude Stein. What did she mean? I'll leave that for the philos phillos phylos people who think about such things. As for me, I'll just take pictures of them and let you decide. There is no lack of roses to photograph around our hamlet. Everyone seems to have some in their garden, including us. Pink roses blooming now in our back garden. Not to mention the roses that grow in the vineyard, planted at the ends of certain rows of vines. Supposedly they serve a similar function to the "canary in the coal mine." 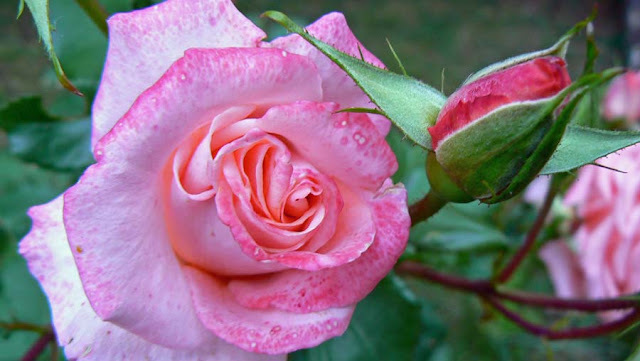 That is, if there are pests or diseases that might harm the vines, they attack the roses first, alerting the grower to the problem. 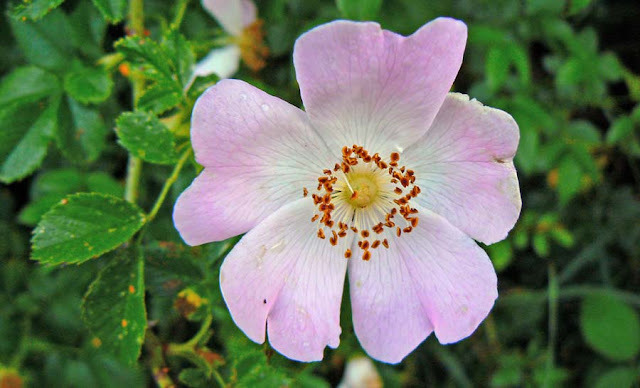 A wild rose in the woods next to the vineyard. There are also roses growing wild at the edges of the woods. I don't know whether these are "escaped" plants that have reverted to a wild state, or if they're actually naturally wild roses. But they're pretty and are in bloom right now. The other day, Ken posted pictures of a crab spider he saw on some daisies out in the vineyard. Well, yesterday morning I was out with the dog and I was looking at the patches of daisies to see if I could see a crab spider. I didn't, but I did see this pretty beetle. 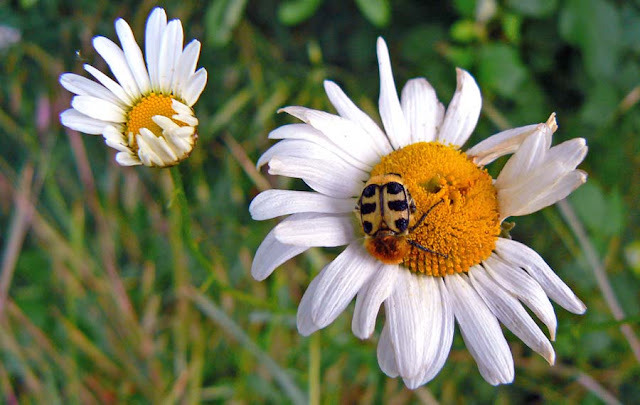 A black and yellow beetle hanging out on a daisy. It was a cool morning, around 60ºF, and the beetle was not moving at all. He let me get the camera real close for the photo. They guys working in the attic said they should be done this week. We're not sure what they mean by "done." It may just mean finished laying the floor and installing the closet doors. There's still a wall to be dry-walled and some finish work to do around the stair opening, not to mention installing the baseboards. But, guess what? I talked to the guys and they said not only are they going to do the drywall, but they plan to install the baseboards, too. And when I mentioned the finish work around the stairwell, they said, "OK." Wow. 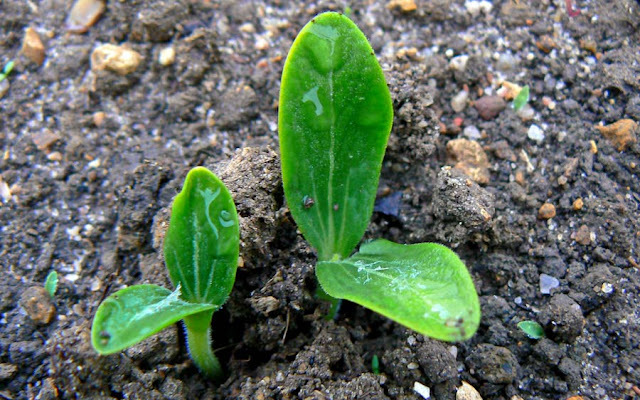 The seeds I planted in the garden last week are sprouting! These are (or will be) zucchini plants. I have two hills of about six or eight seeds each. They'll get thinned back to one or two plants per hill. That should give us enough zucchini to feed the neighborhood. Morning dew on the zucchini sprouts; only the strongest will survive. The pattypan squash is also sprouting, as are the swiss chard and the radish plants. The run of hot weather we're expecting later this week will do them all a world of good. It's fun to watch things grow.